It seemed fitting that I do a Valentine's Day themed comic this week, considering...well, it was Valentine's Day on Tuesday. 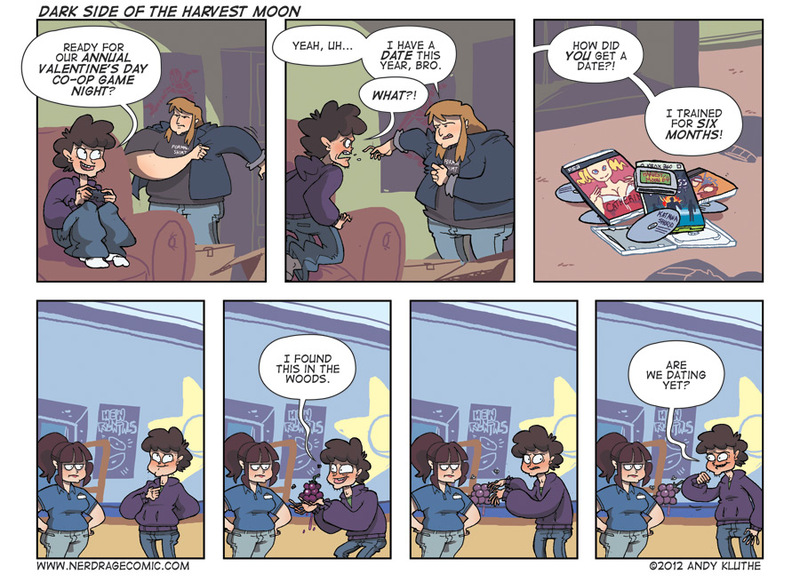 I didn't want to get into Elliott being so pants-on-head-stupid that he can confuse video games with reality (an awful web comic trope -- if you peer deep enough into this comic I think you'll may even pick up a little Megatokyo), but Harvest Moon is just a little bit creepy when juxtaposed with reality. You pick a random gal in town and hand her things you grow (or crap you found in the mountains, if you're me) until she likes you enough to get hitched. That's how dating works, right? As a little social experiment, if you read these update posts, please send me an email. I'm curious how many of my readers get this far, or realize my email is available at the top of the page. NECA put on a good show at Toy Fair. Unfortunately the Demoman figure wasn't on display...because somebody stole his head. Let's hope we can bring him home safe. Konami has announced that as of this June Metal Gear Online will be shut down forever. If you're one of the few people that could sort through making a Konami ID to play this game, go enjoy it while you can. For those who were already excited for Figma Samus, here's a prototype shot of Figma Link.